If there’s one thing I love the midwest for it’s their damn good BBQ! (And all my friends who live there too:)) On my first trip out to Kansas City, my brother-in-law, whose’s originally from Wichita, took us to this fine establishment. Actually, it’s in a gas station but once you get inside it’s not scary at all. 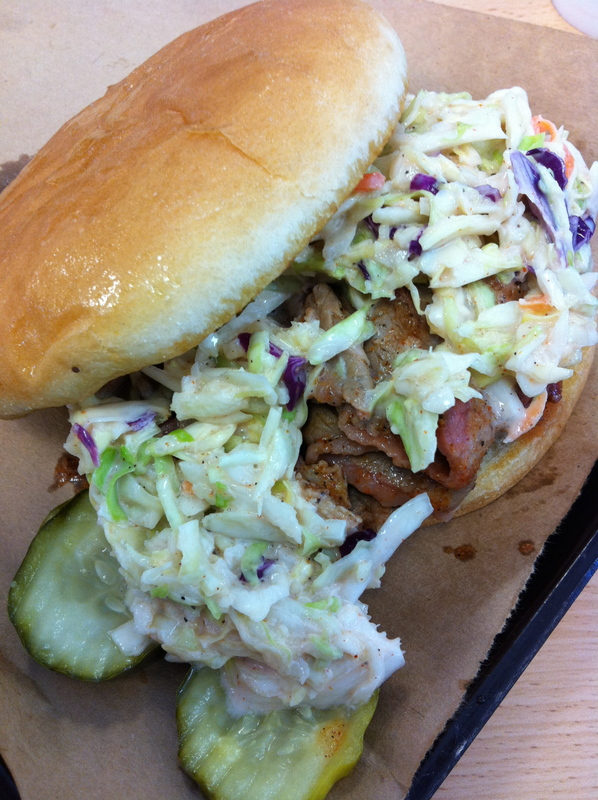 The menu is huge and it’s a little overwhelming but I finally narrowed down my selection to the Carolina Style Brisket Sandwich – served on a bun with spicy slaw and Bubba’s Sauce. We also got a side of beans and coleslaw. There’s plenty of extra BBQ sauce on the table which I used liberally. *My husband gets The Z-Man Sandwich – brisket, smoked provolone, topped w/ two onion rings on a kaiser bun. I’ve had a bite and it’s pretty tasty.